Booking a track day can be pretty intimidating, even for those of us who get to ride on a track fairly often. The genius behind SportbikeTrackGuide.com agrees with me, which is why he developed a site that aggregates all of the upcoming track day info into one place. Every track has a website, every track day organizer has a website, and it’s always confusing trying to skip from one site to the next to see what’s available when you want to ride. Here’s a site that fixes all that. It’s separated into three main sections which are extremely self-explanatory, but I’ll run through them anyways. The Track Days section takes you: info on upcoming track days, duh. When you first click on it, the site shows all of the track days in the country sorted in chronological order. You can search by specific dates or locations and, while there isn’t a range you can set, the search results are pretty good about keeping it within driving distance. For instance, I searched for track days near Los Angeles, and it returned track days as far as Laguna Seca (in Monterey and six or so hours away), but not Thunderhill (in Willows, and eight or so hours away). I tried searching for just California, which gave me all of the tracks in California. Once you click on a track day you’re interested in, there are options to add it to your Google or iCal calendar, links to the track organizer to book the track day or track for more info, and maps to the track. Unfortunately, they have not yet linked the track map to the listing of each track day, but we’d love to see that updated. 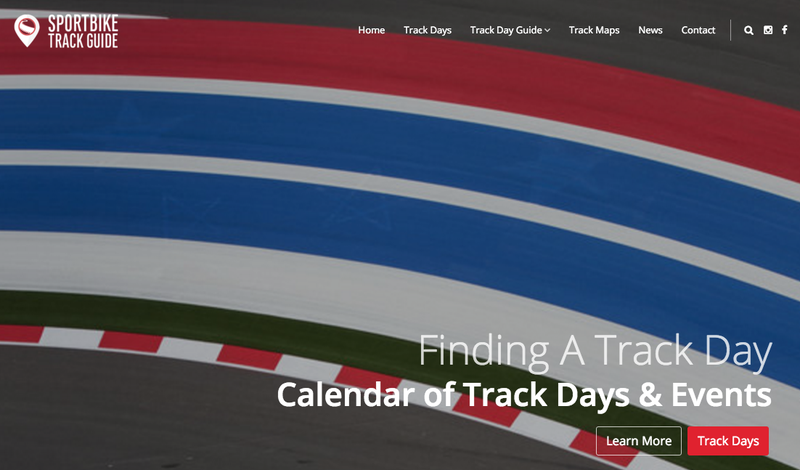 Track Day Guide has three sections which explain the general structure of a track day and how to choose a group, and then lists of the track organizations and tracks. The final main page is the Track Maps page, which lists all of the tracks in alphabetical order for you to choose from. Clicking on one downloads a pdf of a one-dimensional map of the track. They don’t have every map listed (the first I looked for was Sepang and it was missing), and it would be nice to give the maps some more info. Short of playing a racing game to learn the track maps, studying them can be instrumental in learning a new track. SportbikeTrackGuide.com is a great step in the right direction, and we’d love to see them fill out the track maps section with more robust information. But, for now, we’ll settle for not having to search every track organizers calendar for some seat time. Best website ever? Besides this one, maybe.